Boron (B) toxicity often limits crop yield and the quality of production in agricultural areas. Here, we investigated the effects of calcium (Ca), silicon (Si) and salicylic acid (SA) on development of B toxicity, B allocation in canola (Brassica napus cultivar Sarw 4) and its role in non-enzymatic antioxidants in relation to yield of this cultivar under B toxicity. Canola seedlings were subjected to four B levels induced by boric acid in the absence or presence of Ca, Si and SA. The results showed that Ca, Si and SA addition ameliorated the inhibition in canola growth, water content (WC), and improved siliqua number, siliqua weight and seed index. 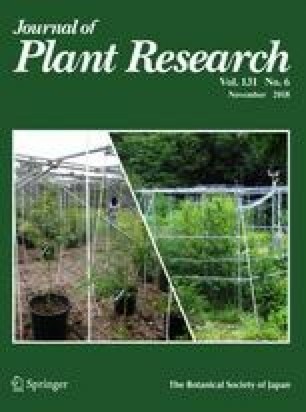 The B content in shoots and roots and total B accumulation in the whole plant were increased in control plants under B-toxicity-stress, and these parameters were significantly decreased by addition of Ca, Si and SA. The shoot ascorbate pool (ascorbate, AsA, and dehydroascorbate, DHA), α-tocopherol and phenolics (free and bound) were increased under B toxicity, and were significantly decreased in most cases by addition of Ca, Si and SA, except α-tocopherol, which increased at low B levels (0, 25 and 50 mg kg soil−1). The glutathione content did not obviously change by B stress, while added Ca, Si and SA inhibited its accumulation under B stress. In addition, B toxicity reduced the shoot flavonoids content; however, this reduction was not alleviated by the use of Ca, Si and SA treatments. It could be concluded that growth and yield of canola plants grown under high B concentration improved after external application of Ca, Si or SA. The online version of this article ( https://doi.org/10.1007/s10265-018-1008-y) contains supplementary material, which is available to authorized users.